When you see a rabbit in the wild, you might wonder what he needs to survive. After all, these critters seem to show up in the oddest places. The question of what do wild rabbits eat is probably something most of us have pondered after catching sight of a fluffy bunny in an unlikely location or when wondering what to feed our own pet. The truth is the wild rabbits diet is going to be different from what is fed to a pet. In the wild, rabbits primarily eat whatever leafy plants they can get their teeth on. That’s why so many gardeners and farmers view them as a nuisance. 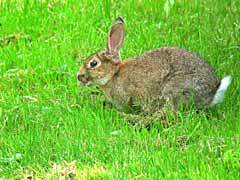 But rabbits cannot live by plants alone so they also eat their fair share woody plants, tree bark, and plant buds. That may not sound like a well-balanced diet to use but for the rabbits it works well. Now if you are caring for rabbits and want to give them a healthy diet you don’t have to go rummaging through the woods to find these same types of goodies. Instead, you can substitute hay. Rabbits should have all of the hay they want. You can also safely give your rabbit fresh vegetables, especially those leafy greens which are a favorite of theirs contrary to what most of us have seen in cartoons. Pet bunny rabbits can also eat very small amounts of fresh fruits daily. For example, you could give about two tablespoons of apple to your rabbit. Too much fruit can upset their digestive systems. Rabbits need lots of water to stay healthy so make sure they always have an ample supply of fresh water handy. They will also get some hydration from the fresh vegetables – another good reason to include them. You might also want to set up a rabbit litter box and begin training him how to use the box. A potty trained rabbit can move more freely around the house without the risk of messes. Just be aware that training requires patience and consistency. Along with the answer to what do wild rabbits eat, you now know a few more things about carrying for you non-wild pet bunny, too.